Tapping into the 1980s female wrestling scene, Funko Pop GLOW offers figures with an old-school vibe. Based on the drama found in the ring with the Gorgeous Ladies of Wrestling (aka G.L.O.W. ), the GLOW vinyl releases highlight the stars of the Netflix series. 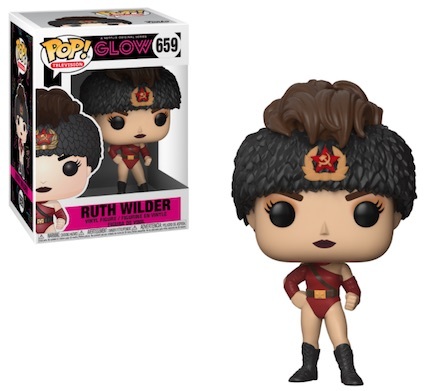 Of course, there's Ruth Wilder, the struggling actress played by Alison Brie. Her figure comes outfitted as her "Zoya the Destroya" persona. Joining Wilder is her best friend, Debbie Eagan, a former soap opera actress portrayed by Betty Gilpin. The figure is dressed as Liberty Belle, the patriotic counterpart to Wilder's Soviet heel. Liberty Belle's costume includes stars and a red, white and blue color scheme. Shop GLOW Pop! vinyl figures on Entertainment Earth. Although the initial Funko Pop GLOW announcement only revealed the two figures, there are many other subjects that could work well here. That includes Carmen "Machu Picchu" Wade, head trainer Cherry Bang, and director Sam Sylvia (played by Marc Maron). There are also quite a few recurring characters that would appeal to fans and collectors of the show, and further expand the Pop! Television line. Buy figures on Amazon using the links below. ALISON BRIE SIGNED GLOW PHOTO! 8x12 BETTY GILPIN AUTOGRAPH! NETFLIX PSA BAS COA!